These are some of my items from the refrigerated sections. Tofu: I love the Trader Joe’s Oranic tofu. I always get either firm or extra firm, and I love cooking tofu dishes. 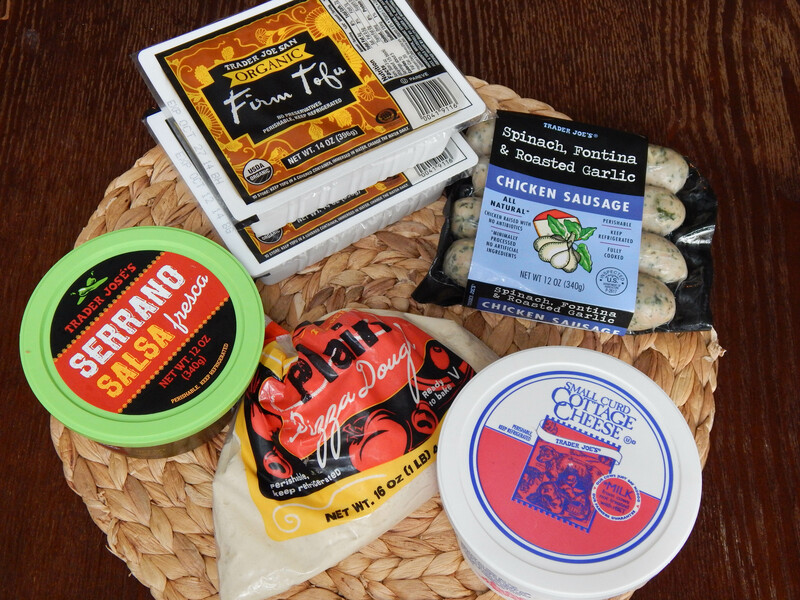 Chicken Sausage: I think this is my husband, Tommy’s, favorite item from Trader Joe’s. He has tried a few other flavors which he also likes, but he loves these Spinach, Fontina and Roasted Garlic Chicken Sausages. Cottage cheese: Not my fave, but Tommy wanted it. Pizza Dough: I haven’t tried it before, but I will be using it to make a pizza soon. Salsa: This salsa is so good! I love to make my own salsa, but this is a good one with nice spice and fresh flavor. Here are some snacks. 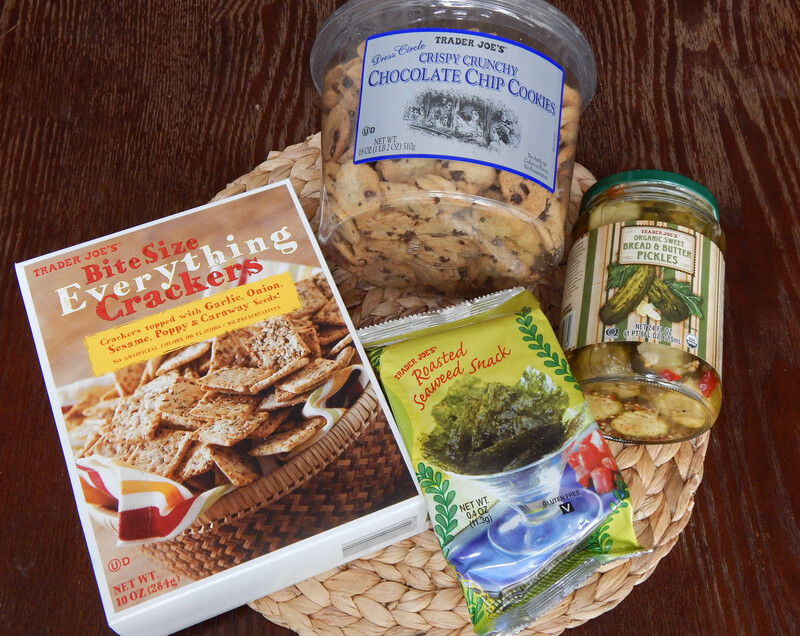 Bite Size Everything Crackers: I plan to pair these with some hummus or eat alone as a snack. Crunchy, little chocolate chip cookies: They have a hint of coconut. I loved these! Sweet Pickles: Ewwww. I hate sweet pickles, this was a husband pick. Roasted Seaweed: We love this in the original flavor, and bought the last two packs. 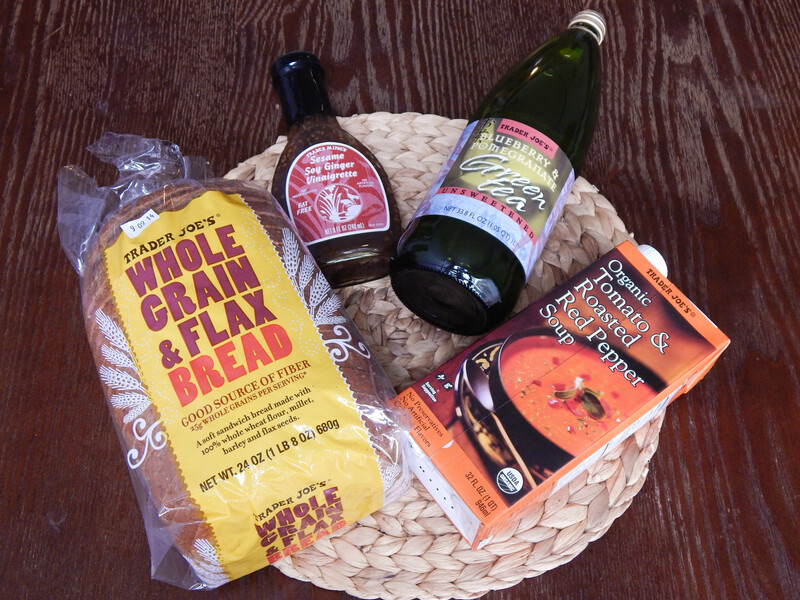 Here are the pantry items we picked up. Sandwich bread: Healthy ingredients. We really like this bread toasted for sandwiches. Soy Ginger Vinaigrette: Very flavorful and fat free with no artificial ingredients. Blueberry Pomegranate Green Tea Unsweetened: This was so refreshing chilled over ice! If you like unsweetened tea try this, it has a fruity background flavor. I got two. Organic Soup: Lately I have been liking tomato soups, so I am excited to try this one. I have heard it’s very tasty. 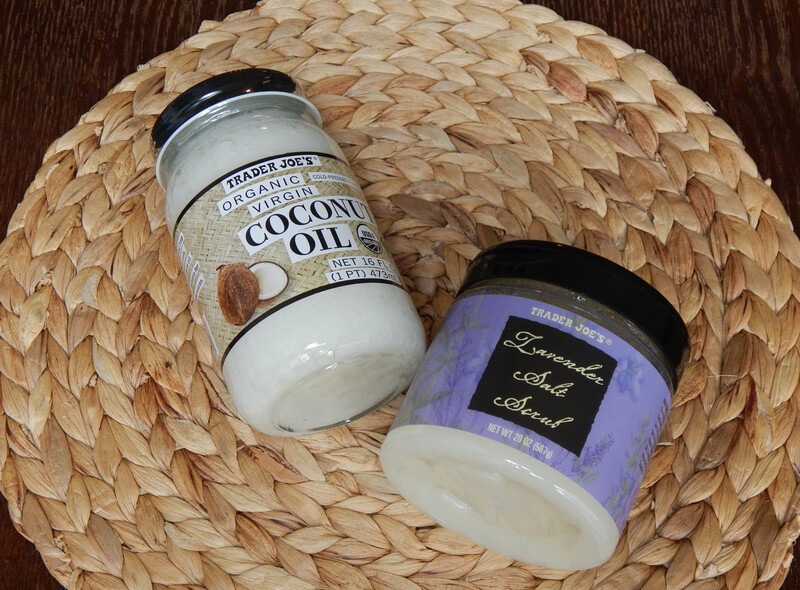 Beauty Products: Organic Virgin Cold Pressed and Unrefined Coconut Oil! That is a long name for one cute glass jar. I have been hearing about all of the wonderful benefits of coconut oil, and I feel so behind for just now trying it out. I was so surprised by the strong coconut scent when I opened the jar, but in a good way. So far I tried using is at a moisturizer on my skin, and I liked it. Rub it in really well. I will be trying it out as a makeup remover, and cooking with is as well. Lavender Salt Scrub: This has a nice fresh scent that lightly stays on the skin. I used it in the shower and rubbed it onto my skin to exfoliate. It makes your skin feel soft and smooth. Good buys! Fruit: How sad, we only got a couple things! Bananas: for smoothies. 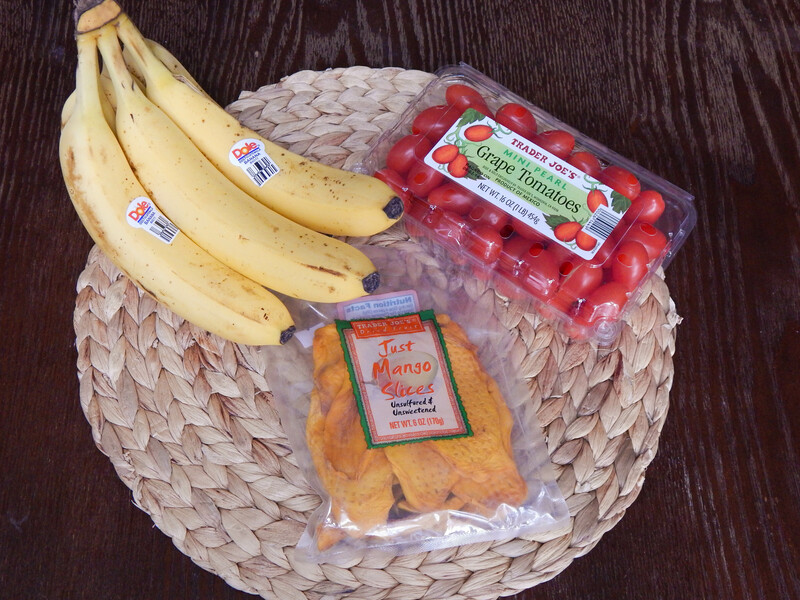 Grape Tomatoes: I really don’t like tomatoes, but they are so good for you. So, I am trying not to throw them off my plate and onto my husbands and actually eat them. Dried Mango: I tried this for the first time, and I like it because it is literally just dried mango. It is not sweetened and there is nothing else added. The texture is a little tough and chewy, but the flavor is great. I love veggies. 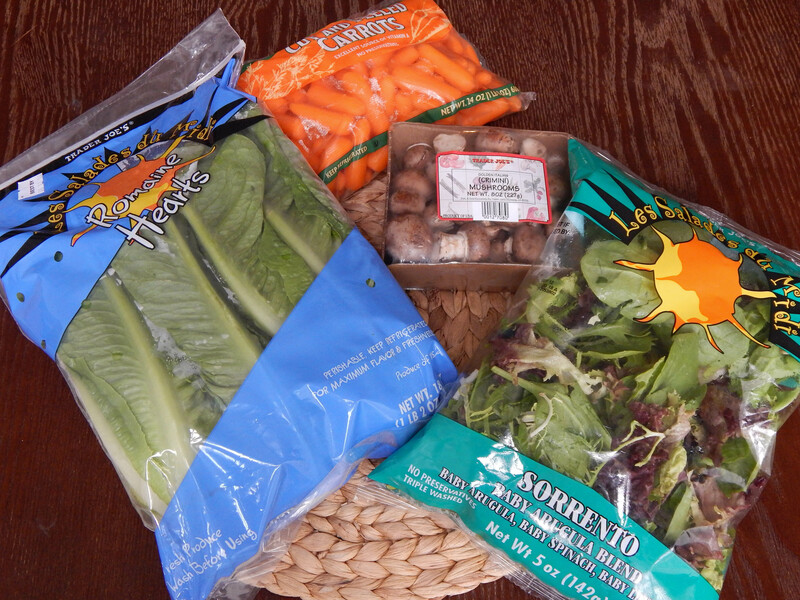 Romaine and baby lettuce blend: We got some basic greens for salad. Mushrooms: Cremini mushrooms are so good! They have a little more flavor than white button mushrooms. Baby carrots: I like to use these for dipping into hummus. 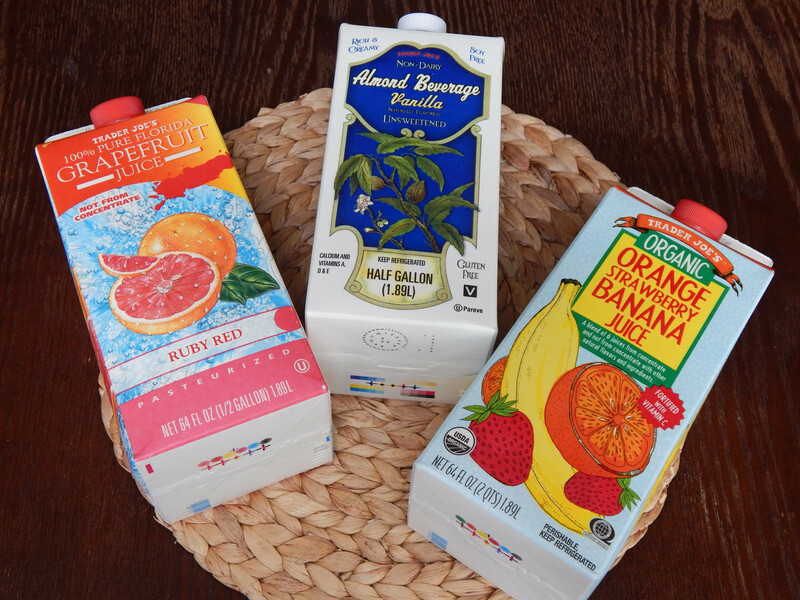 Most of the time we only drink water at home, but trader Joe’s has such good drinks we had to get some! 100% Grapefruit Juice: This was my pick. It’s so tart! I love the flavor, and it is packed with Vitamin C. Organic Orange Strawberry Banana Juice: This was Tommy’s pick. This juice is great in the morning and has a slightly thicker consistency than regular orange juice. Unsweetened Vanilla Almond Milk: My favorite almond milk! I like the unsweetened version best, because when you add it to cereal it doesn’t make it too sweet. It’s also perfect for dipping the mini chocolate chip cookies into (hint hint). We almost never buy regular cow’s milk. This stuff is so much better! Trader Joe’s has amazing frozen food. I usually pick up one or two frozen dinner items. Mandarin Orange Chicken: I have heard this stuff is really good. I’m going to bake it up in the oven, and serve it with some steamed rice and a side of veggies. 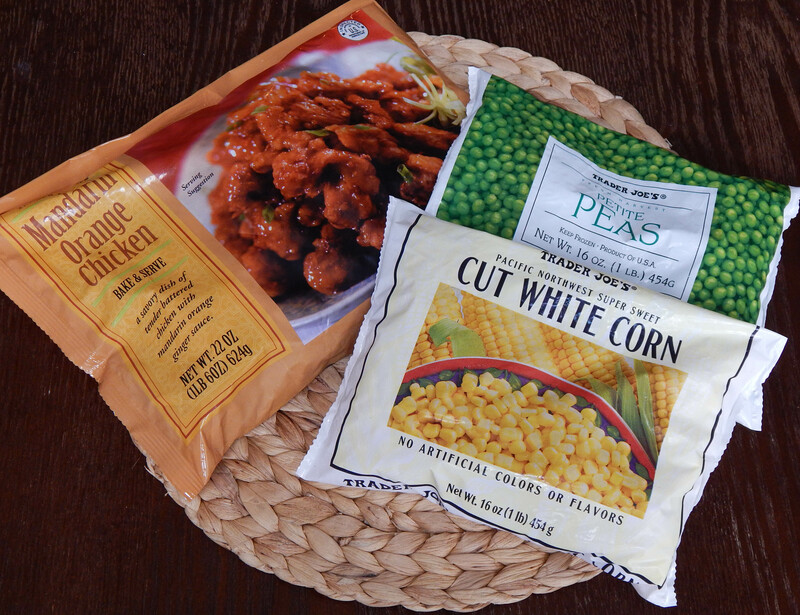 Frozen Peas and Corn: I like to have these two in the freezer so I can quickly toss a handful into anything I may be cooking. This is everything we got. It was a pretty big grocery trip and, and I will be able to make some good meals and snacks with this food. We spent $79 dollars in total. I know I just went, but I already want to go back. I am so bad!